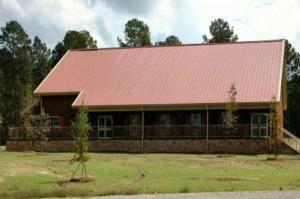 The Henning Conference Center is a large, multipurpose conference center located on the OWL Center grounds. This beautiful building has a rustic feel with a spacious wrap-around porch, complete with benches and rocking chairs overlooking the OWL ponds and pastures. The Henning Conference Center features a large main floor that can accommodate up to 280 guests in comfort. They provide tables and chairs that may be arranged for your conference, meeting or gathering. This building also offers a private meeting room which seats 15. This smaller meeting room is great for business, community, or club meetings. The Henning Conference Center also includes a fully functional commercial kitchen complete with serving stations.